The basil plants on my porch look so sad. Their long twiggy legs are shooting up their final green leaves in a vain attempt to capture the attention of an increasingly elusive sun. So I put them out of their misery, stripped them of the last good leaves and made pesto. Even though my mind is already turning to braised meats, big pots of stew and apple desserts, it's nice to mark a passing season by enjoying one of its signature dishes. This batch of pesto went into this recipe for clams with tomato, which *gasp* calls for a container of store bought pesto. As long as you have a blender or food processor, homemade pesto couldn't be easier to whip up, and you can tailor it to your tastes. (For example, I usually use double the garlic.) 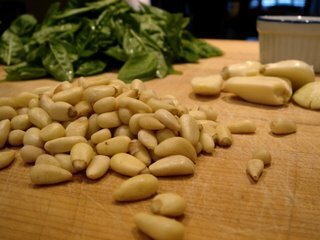 Here's a good recipe to work from (if a little skimpy on the garlic). And farewell fair basil plants ... till we meet again next summer. Sounds like a great idea to add a little butter for winter. I wished I'd been organized to make enough to freeze. 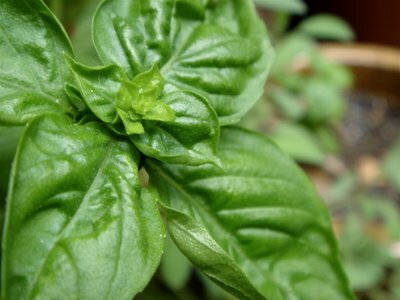 Love that basil pic. I can almost smell it.